Endless sunshine and year-round attractions make Coronado the perfect Southern California beach town. 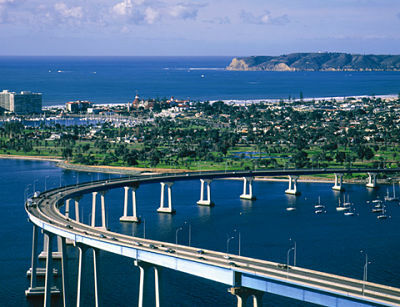 Only a short drive from San Diego, visitors can enjoy a small town feel yet experience big city attractions. By private jet, clients are able to access all three of the local airports including San Diego International Airport (IATA: SAN, ICAO: KSAN, Brown Field Municipal Airport (IATA: SDM, ICAO: KSDM), or McClellan-Palomar Airport (IATA: CLD, ICAO: KCRQ). Transportation can be arranged at any of the airports listed above and will be available planeside upon your arrival. Looking for the perfect beachfront hotel? Hotel Del Coronado is the perfect seaside resort. This Victorian splendor is a national historic landmark and an architectural marvel. Located along the Pacific beachfront, Hotel Del Coronado is home to world class dining and shops, legendary accommodations, and a luxurious spa inspired by the sea. Coronado has one of the best dog-friendly beaches in all of Southern California. Let your pooch run free off-leash as you listen to the roar of a Navy jet flying overhead as it lands at North Island Naval Air Station. Relax on the flat sandy beaches encompassed by gentle waves. Rent a surfboard or boogie board and get wet! Or, set sail by sailboat into the clear ocean air. Looking to dry off? Browse through over 100 shops and local boutiques located along Orange Ave, The Ferry Landing, and Hotel Del Coronado. Hungry yet? With over seventy cafes and restaurants you are sure to find something to melt your taste buds. Ready to book your next charter flight? Allow Desert Jet to arrange all your travel accommodations. Please contact us at (760) 399-1000 or charter@desertjet.com, where a charter specialist will be happy to assist you. Let Desert Jet take you there.